I'm having a QGIS project in local coordinates (Gauss-Kruger, EPSG:3399) with some layers in the same reference system. On top of that, I want to display point coordinates, which I digitized using google maps, so I assume them to be in Pseudo-Mercator/ WGS84 (EPSG:3857). Now, when I add the point coordinates, they won't show up in the map. If I change their reference to EPSG:4326, they are displayed, but they have a mismatch of more than 150 meters. In addition, I loaded a WMS layer, in WGS84 (EPSG:4326) which fits fine with the point coordinates but also does not align with the other layers from the project. I included a partial view of the project, where you can see the misalignment. 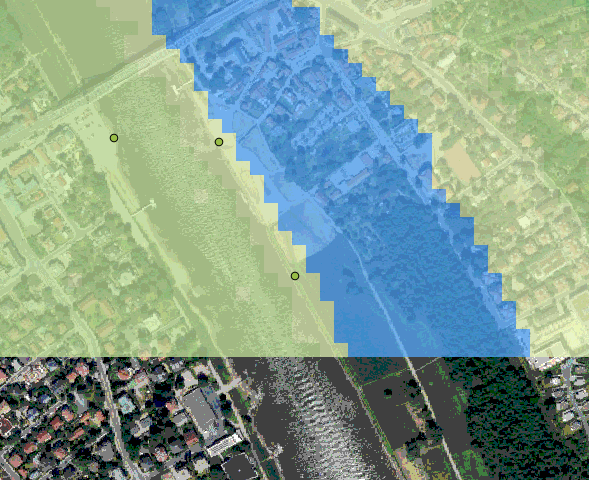 The overlay shows a river obtained from a DTM (in local coordinates) in blue. The displacement with the river in the orthoimage is clearly visible. The green points are the ditigized ones, as said above. I am aware, that the on-the-fly transformation in the GIS might not be able to get me the exact match between local coordinates and global WGS-coordinates. But somehow I need to get the local coordinates from the point locations without having to digitize them again, because I am also missing georeferenced orthoimages in the local coordinates. Not the answer you're looking for? Browse other questions tagged qgis georeferencing coordinate-system epsg or ask your own question. How can I convert geomagnetic coordinates to geographic coordinates without doing the math myself? Understanding QGIS reference frame issue?